Zippers are everywhere these days. I bet you have zipped something today already. Believe it or not, this seemingly little fastening tool took over four men and five decades to develop and popularize in clothing. The zipper was the original brainchild of Elias Howe, inventor of the lockstitch sewing machine. In 1851, he patented the “Automatic, Continuous Clothing Closure” using a string to close the device. After realizing the string didn’t really do the trick, he stopped working on it. Then in 1893, Whitcomb Judson, a mechanical engineer, tried to improve upon Howe’s original idea by patenting the “Clasp Locker or Unlocker for Shoes” using a hook-and-eye closing technique. He brought his idea to the World Fair that year, but the product didn’t sell. Then Gideon Sundback, an electrical engineer, worked to improve Judson’s version from 1906-1913! It is Sundback’s design, which he called the “Separable Fastener”, that was the first to use metal and takes the form of the zipper we know and love today. The modern zipper didn’t really catch on - or was even called a “Zipper” - until 1923. Thanks to B.F. Goodrich, who added zippers to women’s rain galoshes and used onomatopoeia to market the innovation, the term “Zipper” was born. Since then, zippers were all the rage! Today we use them everyday without realizing how much engineering it took to create such a simple, strong and reliable fastener. To learn more about this humble product, check out this Entrepreneur article! 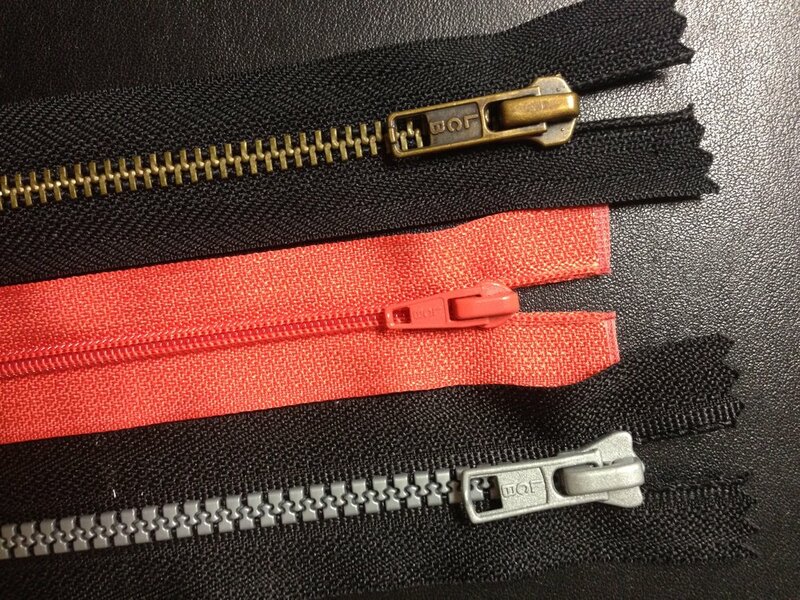 Zippers now have a variety of stylings, including metal teeth (top), coil teeth and plastic teeth. This seems pretty obvious, but now that you know a little bit more about zippers, go find a zipper and appreciate it! Take a real close look at it. What kind of teeth does it have? Does it really make a “zip” sound when you pull it? How many can you find in your house? Your closet? The laundry basket? Go investigate! Yeah, this is a thing. If you have old clothes, cut the zippers out and make something wonderful with them. Here’s an easy way to make a dragonfly pin for example! Other fun ideas include flowers, jewelry, sculptures and more. For many projects, all you’ll need is a zipper, a glue gun and some of your favorite fabric. Have fun! EXPLORE HOW TO ZIP IN OTHER WAYS! The concept of “zippering” has transcended its small physical form to become a technique used in other parts of society, particularly to regulate traffic and lane use on major highways. Where else have you seen “zippering” in your world? Older PostWe Scream for Ice Cream (in Cones)!